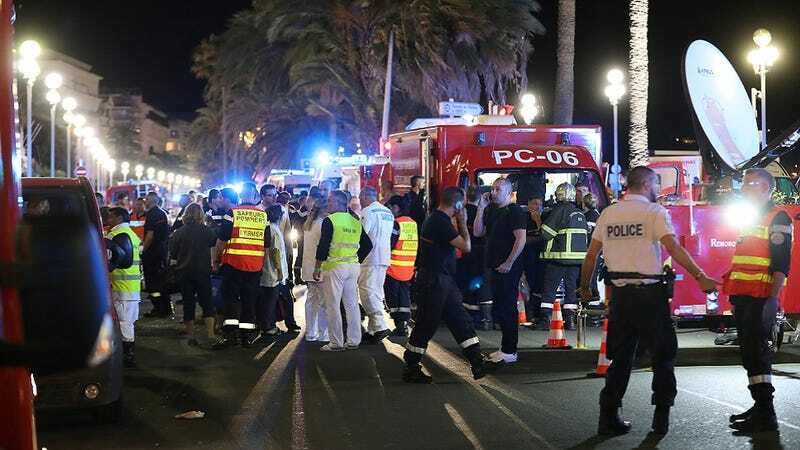 At least 80 people have been reported dead after a truck containing arms and grenades drove into a crowd of people out celebrating Bastille Day in the French City of Nice on Thursday night, in what has now been categorized as a terrorist attack. The incident comes only eight months after a number of orchestrated attacks occurred in Paris last November, killing a total of 130 people, including roughly 89 attendees at the Bataclan theater music venue during an Eagles of Death metal concert. The attack also took place merely days away from the July 26 deadline to lift a state emergency ban on the county set after the aforementioned attacks took place. According to witnesses at the scene, a large white truck careened into a throng of people situated on a main street in the city, all of whom were enjoying the usual festivities for France’s national day of independence. Bystanders also heard gunshots coming from the truck before it turned into the crowd. After remaining at a bar the 15-year-old had patronized to watch a fireworks display for the festivities, Burandé began to realize that what she had first thought was a “false alert” of a terrorist attack was anything but. “[People] were still running,” she added. The attack was also followed by a report of a hostage situation nearby, which ultimately proved to be false. While the perpetrator has since been identified as a Nice resident and a 31-year-old male with both French and Tunisian citizenship via the French television station BFM and other local news sources, his name has not been released to the public, and none of these descriptions or details have been confirmed by authorities. French President François Hollande spoke to the country at a press conference hours after the event was officially declared a terrorist attack. At the time, the death toll was counted at 77 people, among them children. “France has been struck on the day of her national holiday... the symbol of liberty,” Hollande said in an official statement. He then announced that the country’s state of emergency would be extended until October. “France as a whole is under the threat of Islamic terrorism. We have to demonstrate absolute vigilance and show determination that is unfailing,” Hollande added. The president also promised to “strengthen...efforts in Syria and Iraq against those who are attacking [citizens]” on French soil. “France is afflicted but I assure you she is strong and she will always be stronger than the fanatics that want to strike her today,” Hollande concluded. As of now, no organization has come forward to claim responsibility for the attack.